There is no doubt that mirrored furniture can make a room stand out in ways that normal furniture can’t. However mirrored furniture needs to be kept clean to maintain their beauty and elegance. 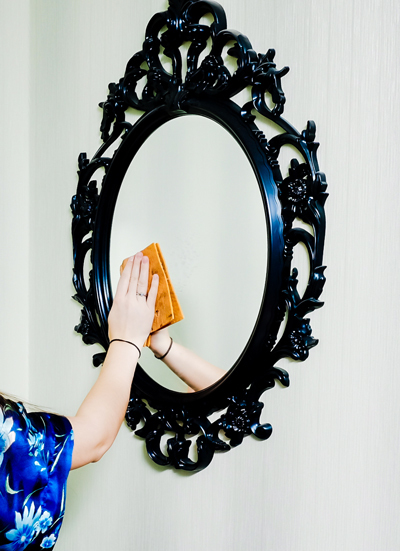 Keeping on top of your mirrored furniture cleaning doesn’t have to be a daunting task – here are a few of our top tips to keep your furniture looking pristine. 1. Keep On Top Of Your Dusting. Letting dust build up on your mirrored furniture is the easiest way for them to lose their shine. Regularly dusting with a soft microfibre cloth will prevent the of dust and keep your furniture gleaming. It’s important to make sure the cloth you use is soft enough to not make scratches as mirrored furniture can scratch easily. You also want to use a cloth that will not leave any lint or other residue on the surface. Depending on the dust build up in your house you may want to dust anything from once a week up to once a month. 2. Don’t Let Spills Settle. 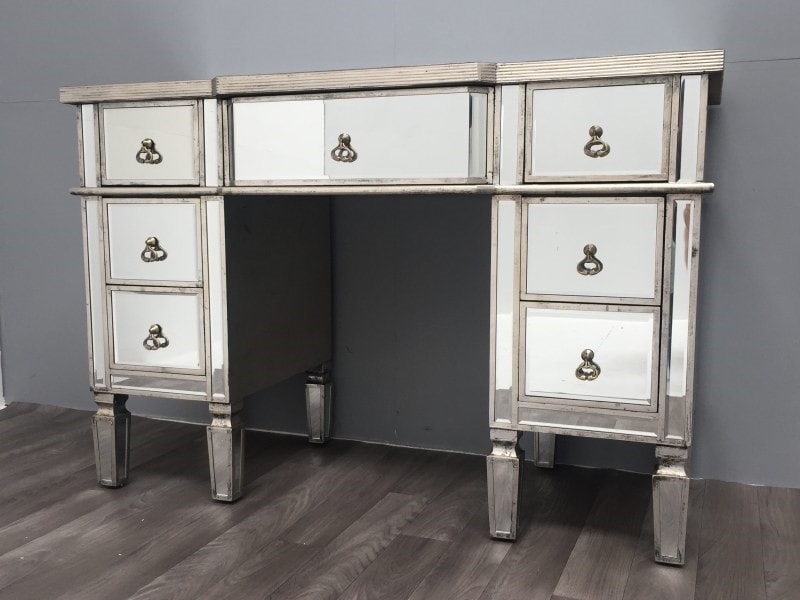 A mirrored dressing table often provides a conundrum as it’s going to be the place where you store all sorts of substances that we usually recommend to keep away from mirrored furniture. These include things like hair dyes, lotions and perfumes that when spilled can lead to stains. We recommendto avoid keeping these substances on your mirrored furniture where possible. When these substances are unavoidable, you should be able to avoid stains by making sure no liquids come into contact with the surface and making sure the bottom of all bottles are dry. When the inevitable spill does happen from time to time, quickly using a slightly dampened cloth should prevent any permanent staining. Make sure to dry properly as even the smallest water residue can lead to staining if left. Polishing your mirrored furniture is another important task to keep them shining. We recommend polishing at least every two weeks if you want to keep your furniture looking like new. Smudges, fingerprints and other marks are likely to be picked up after usage so some people may want to have a quick polish after every use. Polishing your mirrored furniture should be an easy enough task, all you’ll need is a soft cloth and some glass cleaner that is suitable for mirrors. The label should indicate whether or not your cleaner is suitable for mirrors. When cleaning, spray your cleaner onto the cloth rather than on the furniture itself. For any stubborn marks or stains, using a mix of distilled white vinegar and water should help. Just be sure not to leave any streaks on the mirror. Mirrored furniture can pick up scratches and chips if not cared for properly. We recommend routinely checking your furniture to make sure they aren’t damaged. Of course, avoiding damage in the first place is the ideal solution so here are a few tips to keep your mirrored furniture scratch and chip free. When attaching things such as handles or knobs to mirrored chest of drawers, be careful not to overtighten. Tighten until the screw is firm and there is no wobble but don’t go any further as this can easily lead to cracks. Be careful where you place your mirrored furniture. Try to avoid high traffic areas of your home where people may be squeezing past and be at risk of scratching. Avoid placing your furniture behind doors so they won’t get knocked when opening or closing them. Be extra careful when moving mirrored furniture. Moving by hand is safer than using trolleys or other forms of transport, but if you are using a trolley always cover with a safe cloth first. For heavier or more delicate furniture we always recommend using licensed and insured professional furniture movers. Try to keep small children and pets away. Children and pets will often be attracted to the shine of mirrored furniture but are also likely to leave stains or scratches. You may want to keep your mirrored furniture in pet free rooms or cover them when children are around if necessary. Don’t place sharp or rough objects on your mirrored furniture and don’t drag anything across the surface. This is probably the most common cause of damage and can be easily avoided by taking extra care when using your furniture. If you do have damage on your mirrored furniture, it’s possible to get them professionally repaired and of course we have plenty of replacements here at Interiors in Vogue if you need a brand new piece!